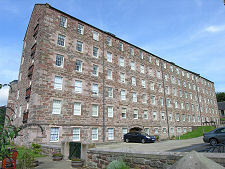 Stanley Mills stands on the banks of the River Tay, on the south side of a peninsula formed by a tight loop in the river. 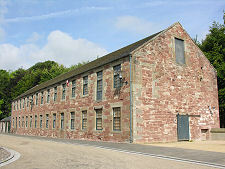 Today, parts of it have been converted into housing, while the earliest mill buildings have been opened as a visitor attraction by Historic Environment Scotland, telling the story of the mills and the people who worked here. 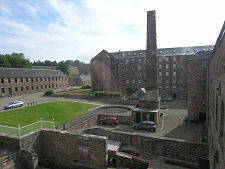 Stanley Mills can be found some six miles north of Perth and a mile and a half east of the A9. You reach it through the village of Stanley, a planned village built to serve the mills in the years from 1784. From here you descend into the valley of the River Tay and follow the signs to the visitors' car park, which has been laid out behind the mill lade. As you wander around this surprisingly large complex of mills, it is worth remembering that some parts have been converted into housing and are private. From the car park you make your way though the complex to the north end of the most easterly of the main mill buildings, the Bell Mill, built in 1786-7. 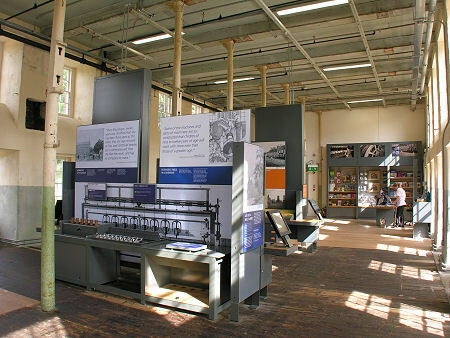 Entrance to the exhibition areas is via a door in the end of the Bell Mill, and this leads to the visitor reception, shop and first large exhibition space at Stanley Mills. 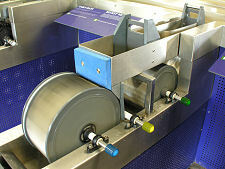 All parts of the exhibition are fully wheelchair accessible. 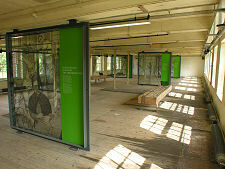 Level 1 of the Bell Mill tells the story of 200 years of cotton production at Stanley Mills. A range of exhibits covers the good times and the bad. 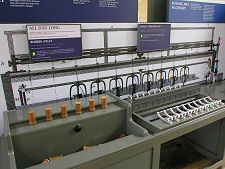 Here you can chart the development of the mills over their lifetime, find out about the different owners and the innovations they introduced, and discover the way working life in the mills was affected by changing attitudes to life and work in society more widely. Here, too, you can view the range of machinery on view, and even experience for yourself the demands placed on the workforce in terms of concentration and manual dexterity, through some very clever and engaging interactive exhibits. Next you descend to the ground floor below the space you have just explored. Here you can see the outhouse in which tar was used to waterproof cotton belts used to drive machinery in the latter part of the 1800s. 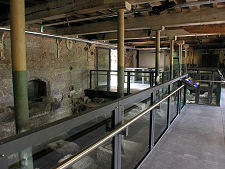 The ground floor of the Bell Mill itself has seen extensive archaeological excavations in recent years, the results of which remain on view. 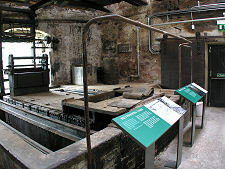 Here you can view the pits in which the original 1787 waterwheels turned. Just outside the Bell Mill, a walkway allows you to view the new wheel pits dug in 1823 to house the much larger waterwheels installed during a significant expansion of the mills. From here you proceed into the west end of Level 0 of the Mid Mill, also built as part of the 1823 expansion. 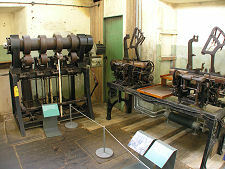 This houses some of the early hoisting machinery used in Stanley Mills. 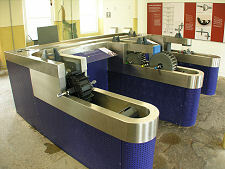 It is also home to what children of all ages will regard as the star of any tour of the mills, an extremely large and robust stainless steel fixture which allows you to test out the relative efficiencies of different types of water wheels and turbines by directing a very powerful flow of water through or over them. On Level 1 of the Mid Mill is the carding room, home to some truly industrial scale machinery once used to comb out raw cotton into strips. These are the only carding machines still in situ in Scotland, and while you get no sense of the dusty, deafening, environment of a carding room in full production, the machines themselves remain extremely impressive. 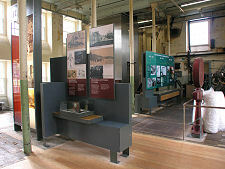 The final area of the exhibition is on Level 2 of the Bell Mill. This has changed little since the mill was built in 1787 and is thought to be the best preserved 18th century workspace anywhere in the world. While the room itself is beautifully preserved, the machinery which once occupied it has long gone. Instead, the space is used to house a series of graphic semi-transparent screens. When combined with audio feeds triggered by the movement of visitors around the room, they start to bring to life the real people who once worked and lived here. The story of Stanley Mills is a complex one in which few people made any money from their investment. The owner of the land here in the late 1700s was John Murray, the 4th Duke of Atholl. 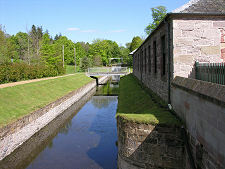 He wanted to make use of the huge flow of water afforded by the River Tay to process cotton. 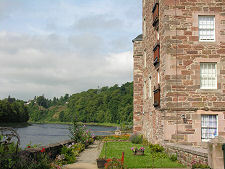 The River Tay here flows around what is effectively a peninsula formed by a tight bend in the river. The river level on the north side of the peninsula is 21ft higher than it is on the south side, and as early as 1729 a tunnel had been bored through the peninsula to allow water to power a corn mill here. The local MP, George Dempster, was also an enthusiast for the scheme. He visited Cromford in Derbyshire, where he persuaded the father of industrialised cotton mills, Richard Arkwright, to come to Scotland to help establish a cotton mill at Stanley. The result was the Bell Mill, which in its initial form opened for business in 1787. 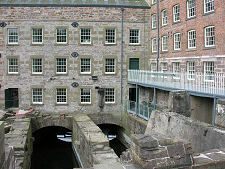 Within 10 years 350 people were employed and the East Mill was added in the 1790s. 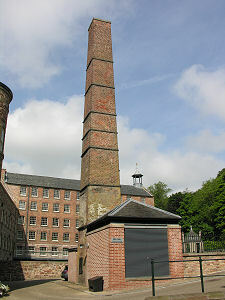 The timing proved poor, because the onset of the Napoleonic Wars produced an economic downturn, and after the East Mill burned down in 1799, Stanley Mills closed altogether. George Dempster later said the failure had left him with debts of £8,000 (equivalent to nearly £500,000 today). 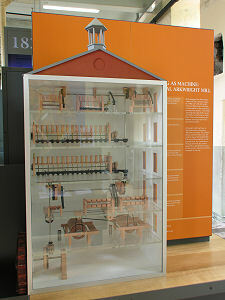 James Craig, a Glasgow manufacturer brought the mills for £4,600 in 1801, in partnership with David Dale, best known for previously establishing the cotton mills at New Lanark on the River Clyde. The enterprise failed again in 1813, this time leaving debts of over £40,000. Stanley Mills reopened once more in 1823 having been purchased by Buchanan & Co of Glasgow. They dramatically expanded the mills, making a series of changes including building the Mid Mill, replacing the East Mill, and completely overhauling the water management system to allow the much larger power demands of the expanded mills to be met through new waterwheels. The arrival of the railway in Stanley in 1848 proved a boon to Stanley Mills. 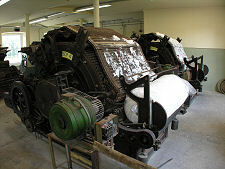 Until then it had taken five days for cotton to be brought to Stanley Mills from Glasgow docks by cart, and as long again for the finished product to return. From 1848 it only took a matter of hours by train. 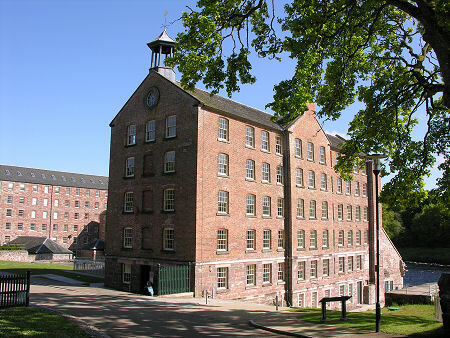 In 1852 Stanley Mills were sold to Samuel Howard, who, during the American Civil War, preferred to speculate with his stocks of cotton rather than keep the mills in production. Another upturn followed the purchase of Stanley Mills by Frank Stewart Sandeman in 1880. He swapped the old waterwheels for much more efficient water turbines and diversified into the production of cotton belts for industrial machines, and selvedge cotton for the booming jute and linen industries. From 1916 he also introduced a secret process that allowed much more efficient production of cotton tape for use in cigarette filters. The two world wars saw Stanley Mills producing large quantities of webbing material for the army, but the general trend from the 1920s onwards was one of decline. By 1967, only the cotton tape for cigarettes was still being produced here, and despite a management buyout in 1979, Stanley Mills closed for good in 1989. 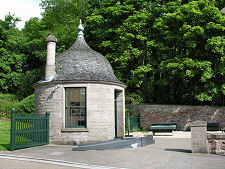 In 1995 Historic Environment Scotland purchased the site. 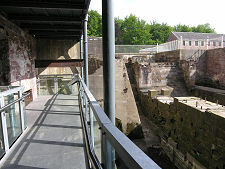 The East Mill and part of the Mid Mill have since been converted to housing, and in early 2008 restoration of the rest of the complex had advanced to the stage where parts of the Bell Mill and Mid Mill could be opened as a visitor attraction.